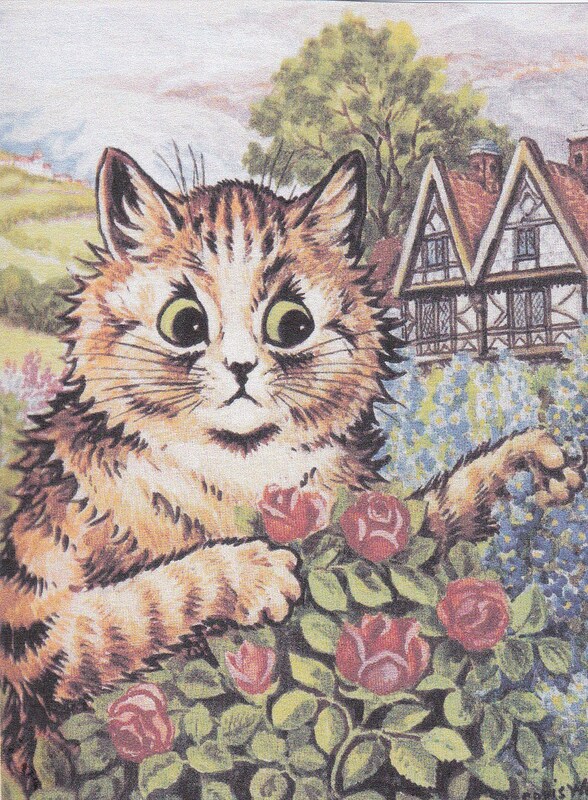 Does anyone know what goes on behind the enigmatic, mysterious eyes of the family cat? Are they waiting there simply to be admired, or is there a deeper purpose to their somnolence? Is their frequent habit of clawing your lap while otherwise giving the appearance of restful contemplation a signal of ulterior motives? There are definitely “cat people” and “dog people”, though there are many who find both an added element to their households. I have one friend who finds room in her heart and in her home for 5 cats and a bulldog. The old fallacy that the species are incompatible is untrue. My father used to laugh at that idea when I sobbed that the dog would cause harm to a new cat. He was proved right when the cat took a hearty swipe at the curious dog’s nose, and let him know that that degree of intimacy was not allowed. Later in life we had several pair who comfortably shared the same bed throughout their lives, much like old married couples. A recent incident on local TV showed a cat attacking and driving away a dog who had assaulted a child. So much for the fallacy that the two species are enemies. 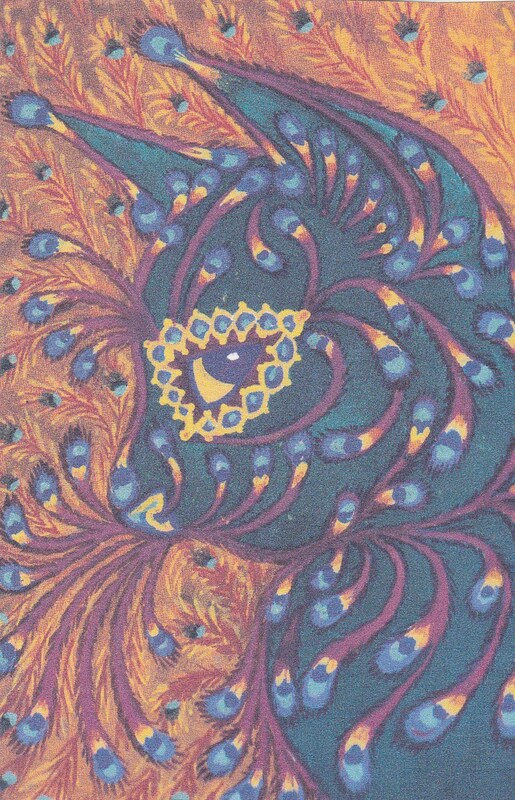 Born in 1860, artist Louis Wain, obsessed with cats, ‘invented a cat style, a cat society, a whole cat world.’ So said H. G. Wells in 1925 when describing the phenomenon of a cat artist who had become a household name over the previous 40 years. 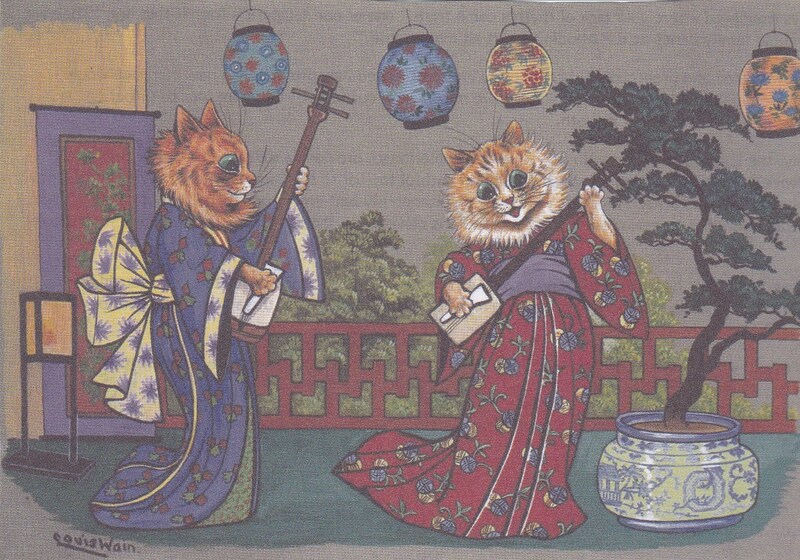 Louis Wain’s cats, dressed as humans in the fashion of the day while having fun; were depicted at restaurants and tea parties, at the Races or at the seaside, celebrating Christmas and birthdays, and disporting themselves at games of tennis, cricket and football. Succeeding generations recognize in them the energetic desire of a society at leisure. 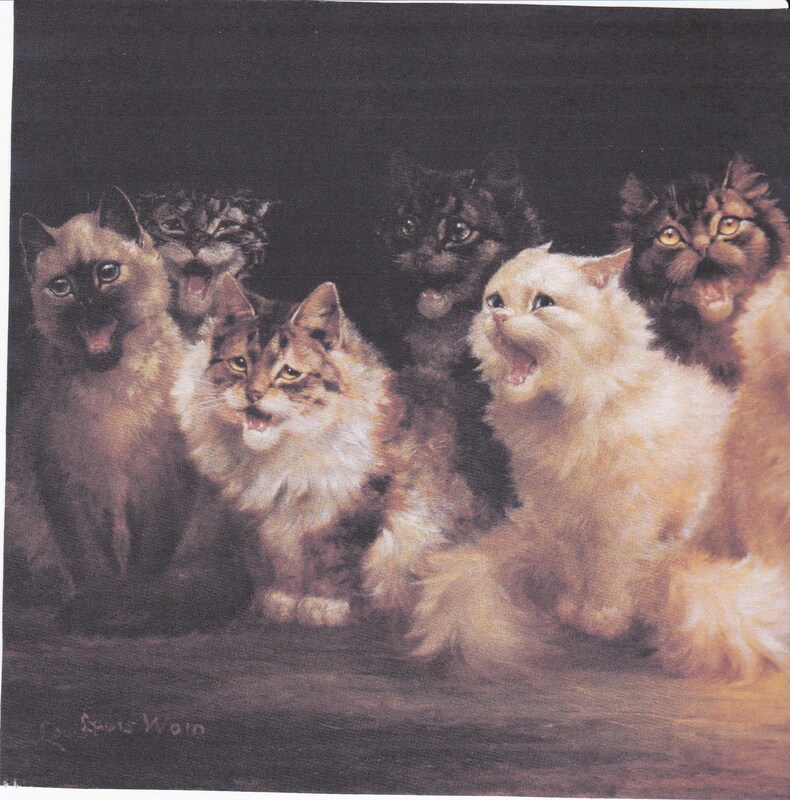 Wain’s world was funny, edgy and animated–a whole cat world. His working life spans the great age of the postcard and the prolific dissemination of his art in this way made him one of the most prevalent and recognisable artists of the early twentieth century. 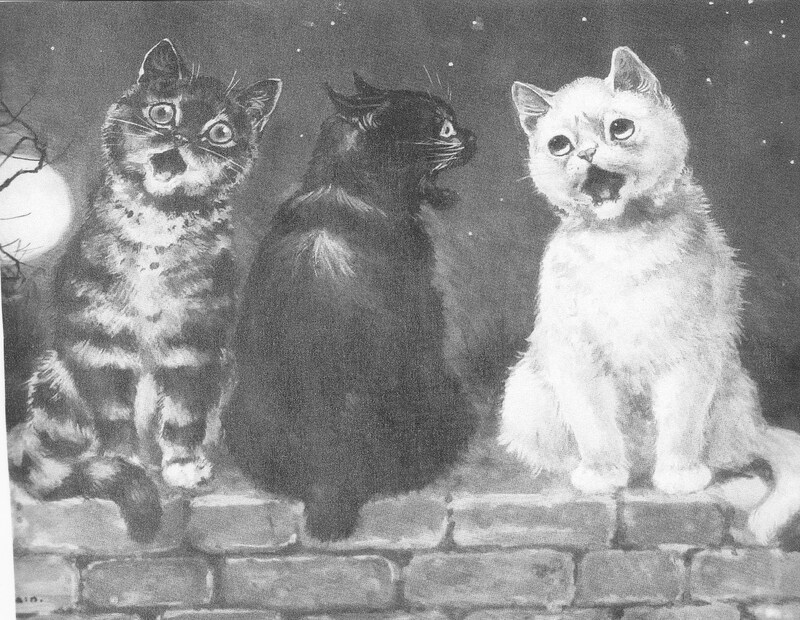 Between 1900 and 1940, 75 different publishers produced over 1100 of his images in postcard form. 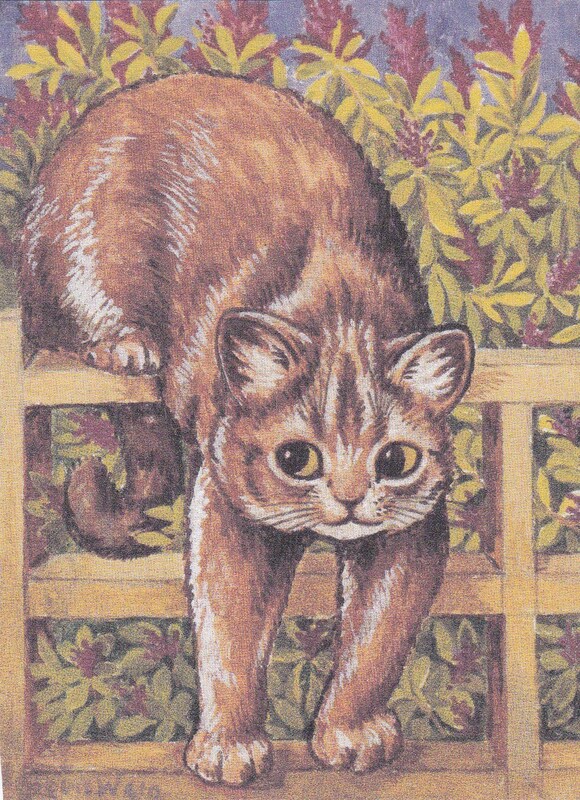 This was an era when the inexpensive postcard frequently took the place of a letter, and the humorous cat depictions were in great demand. His post World War I financial difficulties may have contributed to a rapid decline into schizophrenia as Wain became isolated, impecunious and unmanageable. In 1924, he was certified insane and admitted to Springfield Hospital. Briefly forgotten, he was discovered in this paupers asylum a year later and, following a public appeal involving many artists and writers, and the intervention of the Prime Minister himself who recognized his genius, he was transferred to two or three successively more pleasant hospitals, where he lived on until 1939, painting ceaselessly and recreating a new and ever more colorful cat world, which became more frenzied and colorful as his condition worsened. 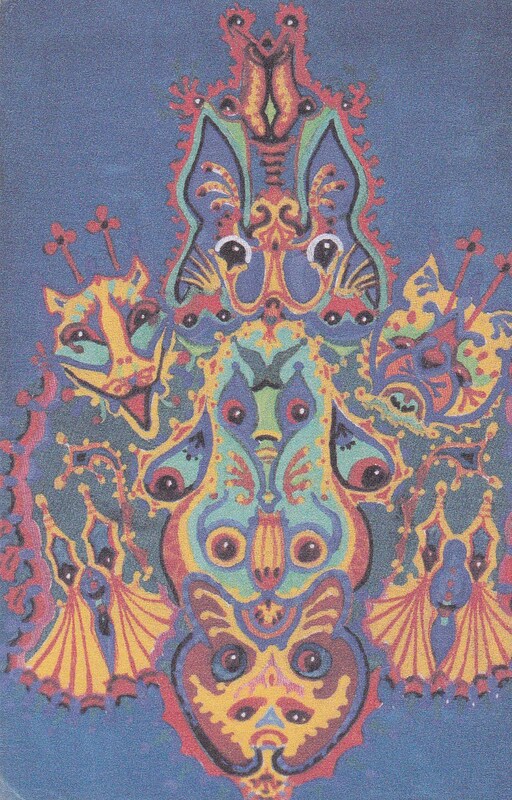 His later work reveals his schizophrenic illness: highly colored cats at times become frenzied, sometimes showing anger, while sometimes in the background are curious recreations of his asylum buildings. 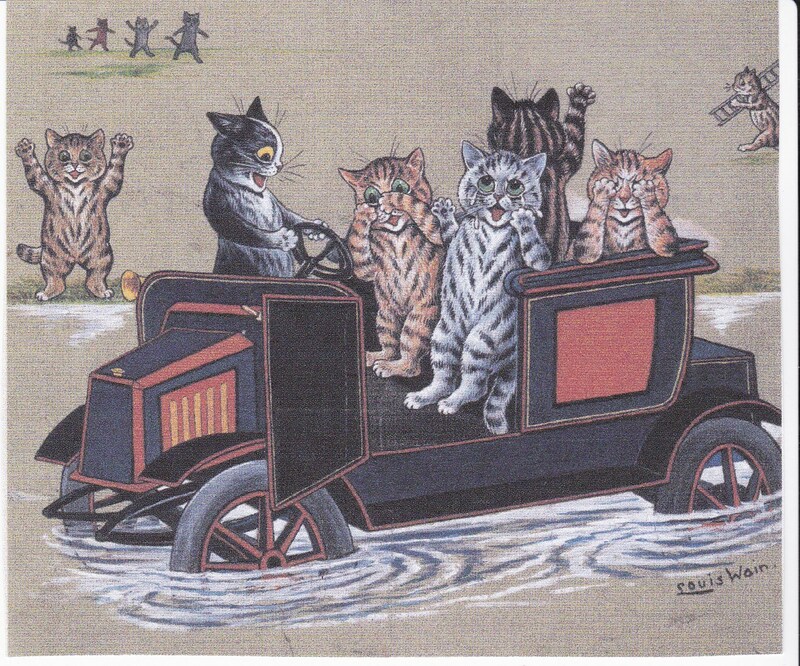 As time went by, Louis Wain’s cats lost their carefree, happy eyes, and became a vehicle to convey his deteriorating sanity. As another, somewhat famous artist said “There are people who love nature even though they are cracked and ill, those people are the painters.” Vincent Van Gogh. 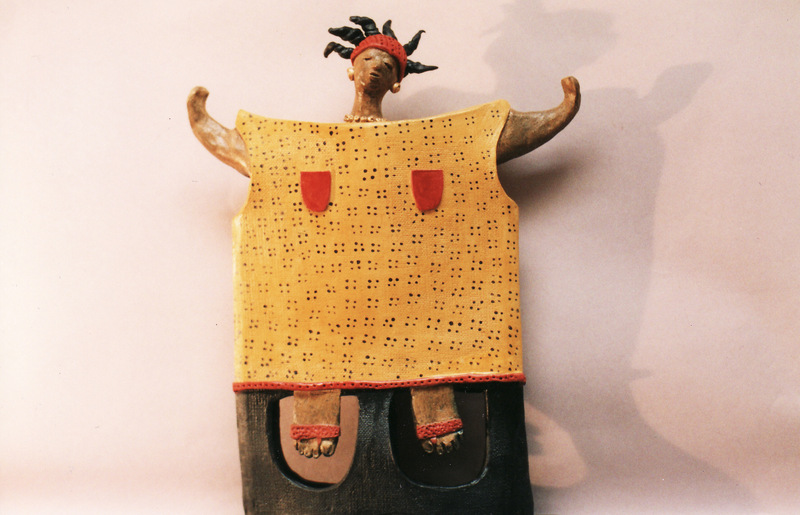 But art should be judged merely by its aesthetics and not by conjecturing about the mental condition of the artist. The pleasures of an ice cream cone aren’t enhanced by enquiring about its recipe. Louis Wains art became pure brilliant design and don’t require an explanation or any need to place them into a familiar world. Philagelos, a composite collection of 260 or so gags in Greek probably put together in the 4th century, is the oldest existing collection of jokes, but not the oldest collection ever heard of. In the 2nd century Athenaeus wrote that Philip II of Macedon paid for a social club in Athens to write down its members’ jokes. Apparently the early jokes were similar to the jokes of today, which throws out any thought that we may have evolved to a higher standard. Do we all laugh at the same jokes? I think not. Things that I find hilarious, frequently bring a shake of the head from Dr. Advice. Contrarily, his idea of funny usually leaves me a bit chilly and wondering if he needs his head examined. The fact that we all find something to laugh at is the more important. Laughter was always a favorite device of ancient monarchs and tyrants, as well as being a weapon used against them. A good king, of course, knew how to take a joke. One of the most famous one-liners of the ancient world was a joking insinuation about the paternity of the Emperor Augustus. The story goes that spotting a man from the provinces who looked much like the himself, the emperor asked if the man’s mother had ever worked in the palace. ‘No’, came the reply, ‘but my father did’. Augustus found that quite humorous. 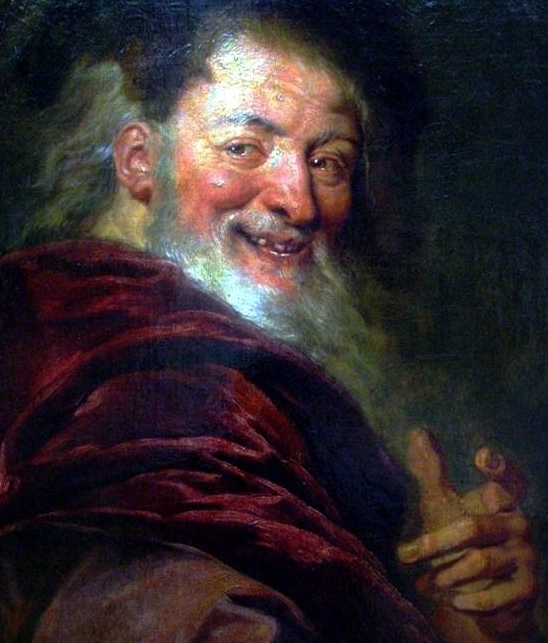 Democritus, renowned as antiquity’s most inveterate laugher, was a stumpy little thumb of a man, who not only loved laughing but making others laugh as well. From Democritus to Whoopi Goldberg, the laugh instigators who grace our world keep the serious stuff at bay, and enable the sick, the lazy and the lame to face the perils of daily living. Today when women go from brown to blond to red to black and back again without blinking we think of hair color products as we think of lipsticks. There are bottles and bottles of hair color product with names like Excellence and Preference and Loving Care and Nice and Easy and so on, each in dozens of different shades. There is even Chocolate/Cherry and Champagne Cocktail, colors that ask “Does She or Doesn’t She? but blithely assume “Yes, she does.” Slogans like these were instantly memorable and managed to take on meanings well outside their stated intentions. 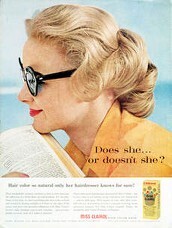 My own history with the hair color industry is memorable, having been a victim of my own foolhardiness more than once. Pick a color, any color, and I have given it a short-term lease on my head. I became a Ginger Rogers blond at the age of 16, which then became a strange shade of green at the end of the summer swim season. On another occasion I dyed it black for a Hawaiian party, which had to be removed swiftly before I spoke before a rather dull women’s group. It became a mottled thatch emanating from my scalp, with varying spots of brown, red and a terrifying streak of purple somewhere above my eyebrows. After my residence with the Pueblo and the bestowal of my honorary name, I colored it a lovely believable dark brown, suitable for my new adopted identity. It remained this color for many years until I nearly believed it was my own. I could wander among the various villages in New Mexico while painting, and not be exposed as “that Anglo blond woman”. Many years later, I let it grow out, at which time I cut it short and asked my good friend what color she would call my hair. She too-promptly replied “Mouse”! So it was back to the bottle. Along with Miss Clairol, I gave myself a home permanent which unfortunately fought with the color and became a bright red Brillo pad on perched on top of my head. It was bound to happen—the day arrives when you find your first gray hair, a reminder that Time is marching on. But silver or gray is trending now in clothing, fashion accessories and home décor. We have all heard that men with gray hair are distinguished looking, while it just makes women look 10 years older. However, a few lucky women can pull off a certain amount of elegance. It’s a dilemma for sure. Do you grab the old familiar bottle, or do you try a new color—gray? It’s the only one I had not tried so I decided to give it a go. A number of years ago, somewhat elderly women became blue, do you remember them? They were generally seen with locks the color of a drop-in toilet freshener, and no, it wasn’t a mistake. They did it on purpose—it took any vestiges of blond out. Streaks of gray usually appear near the ears, giving the impression of “Frankenstein’s Bride”. I once worked for a man who used dark shoe polish to color his ‘side wings.’ I seem to have accomplished the ‘gray mission’ on my own, without the aid of dye or bleach. A grandson once asked me if it was blond or grey. I told him to take his pick. It still looks blond to me when looking in a mirror, but for some reason, it photographs gray. It must be a trick of the camera. The thing to remember is that age is just a number, and hair color does not dictate whether you lead a sedate lifestyle, or behave like a character in “50 Shades of Grey.” The choice is yours. “Good morning madam, show me your dirt”. We all have it. Some more than others. Imagine someone actually offering to see your dirt. If he appears to be an obnoxious, sly-looking pervert with a dirt fetish, close the door as quick as you can. However, if he is holding what appears to be a vacuum cleaner, invite him in for coffee and cleaning. 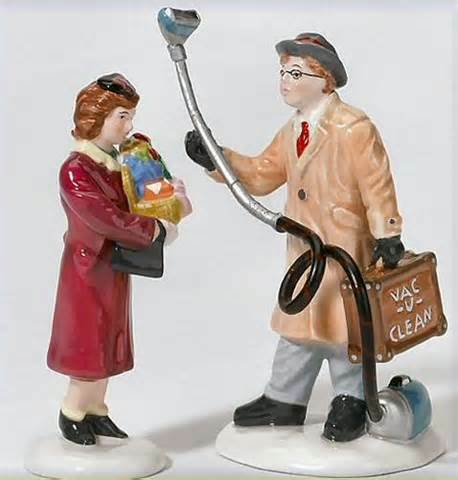 The Jewel Tea Company and Fuller Brush Company employed young men to canvas door to door offering to clean your house and hopefully sell you the equipment to do it. I purchased a Kirby vacuum cleaner about sixty-four years ago after firmly spurning it from the Jewel Tea man. That was before he went right ahead and cleaned a visible path through the center of my living room, clearing dust, dog and cat hair, and unmentionable debris to reveal a perfectly clean wall-to-wall carpet. My Kirby vacuum cleaner moved several times along with the rest of our family for many years. I don’t remember what actually killed it, but it did eventually die, and gave way to several other brands of vacuum cleaner, none with the precision, style, and efficiency, though not the weight and cost of the Kirby vacuum cleaner. Today’s models sell for about $1200, and even Charlie’s hair loss is not worth that much brass. Segue through time and place, and changes of generation. Children, grandchildren and great-grandchildren and who knows how many generations of furry friends have romped through our various homes through the years and each have left remnants of their existence. I am generally able to forestall an embarrassing situation, but when your friends begin asking for a towel to cover the sofa before they will sit on it, it’s time to recognize that the resident brown and white dog is depositing a great deal of his hair throughout the house. 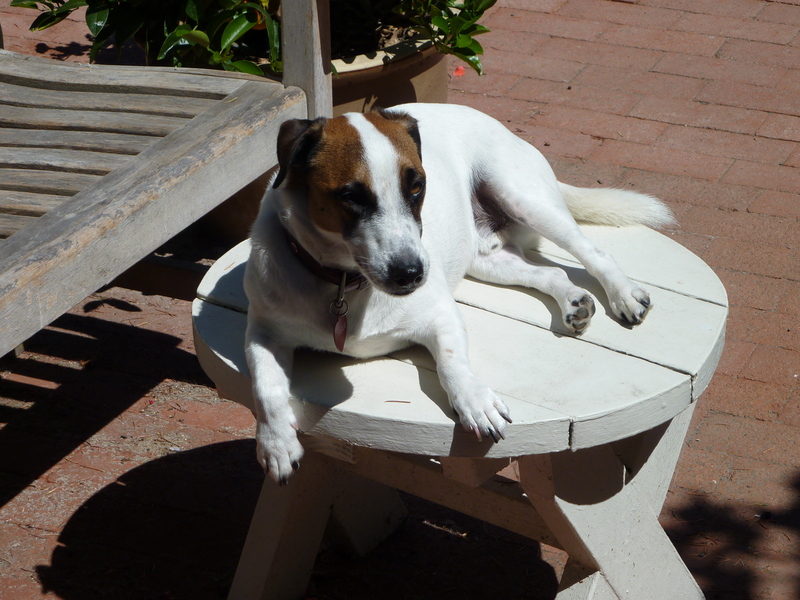 Charlie doesn’t simply walk through a room, he chooses to perform his Jack Russell gymnastics on the red Bokhara and dark Persian carpets as he goes from room to room. My daughter purchased a new vacuum cleaner which promised to remove pet hair, so we purchased the same one. It did not perform as promised, so we gave it away. Since we seemed to be in the vacuum buying mode, we continued looking and researching for the perfect machine to suit our purpose. Our old vacuum was relegated to the garage rug. 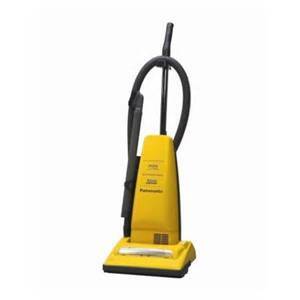 This is the beautiful new yellow vacuum cleaner which has come to live with us, and which promises to inhale most of the white hair which is evidence of the dance of the white dog. The only problem is that this new acquisition has given way to a sudden surge of cleaning activity of all sorts. I found myself at midnight last night wondering what cleaning job I could accomplish today. Instead we went out and had an ice cream sundae.